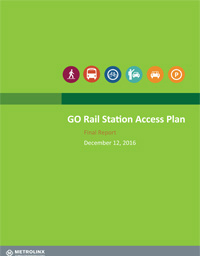 This document updates the 2013 GO Transit Rail Parking & Station Access Plan in response to the Provincial commitment to Regional Express Rail (RER), which will increase GO service and support the development of new stations throughout the GO network. The document updates the 2013 Plan to reflect these changes in service and stations, and the significant increase in ridership expected as a result of these upgrades. The Plan recommends limited parking expansion and a shift towards investment in more sustainable modes of access (such as walking, transit, cycling, carpool, and pick up/drop off) to accommodate and encourage ridership growth in a sustainable and financially responsible way. The 2016 Plan is a high level document intended to be used by Metrolinx to help inform decision making on capital investments, coordinate between stakeholders, support multi-modal access, and monitor the progress and success of investments and strategies over time.